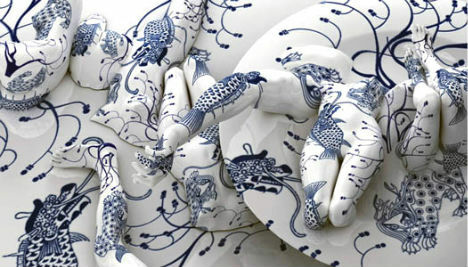 Jumbles of beheaded bodies, limbs entwined, torsos twisting, hands reaching out – in compositions that are both glaringly Asian-influenced and psychedelic – call to mind some orgiastic body painting experiment, until you focus on the strange perspective and profusion of hands in various sizes. This is no ordinary example of beautifully crafted body painting, and as stunningly realistic as the images appear, they’re actually computer-generated. 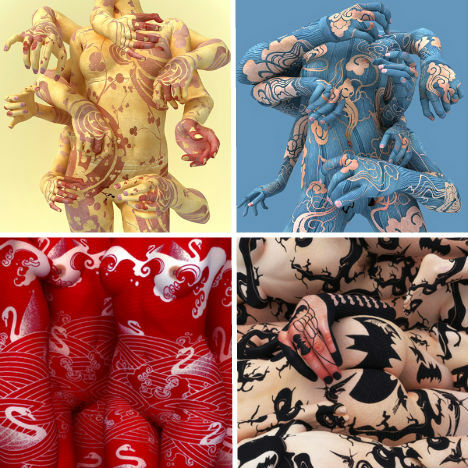 Contemporary Korean artist Kim Joon uses 3D animation software to assemble the perfect body for each piece, building the form and grafting on skin texture before moving on to the intricate designs. One piece, entitled ‘Neverland’, pays respects to Michael Jackson, but deeper behind this lies an homage to what Kim admits is his idea of the perfect male body: ebony-skinned and powerful. But the real star of each digital work is the body decoration, which Kim identifies as tattoos. To Kim – who says his single biggest influence is Jimi Hendrix – tattoos are sensual markings that simultaneously represent desire and repression, beauty and scars. “I would like people to be able to think about their own tattoos and re-examine their lives through seeing my work. Tattoo or tattooing symbolizes the multi-layered composites of desire and will, emotion and action, pain and pleasure of self and other (tattooist) which can be translated as a complex system of complicit activities,” Kim told Art Radar Asia.